Money orders have long been one of the most difficult classes of items to scan: Designed with digital and optical security in mind, they are almost impossible to capture a usable image of. 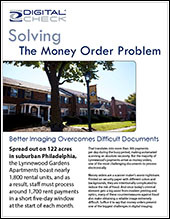 For the Lynnewood Apartments outside of Philadelphia, the 1,000 or more money orders received each month were slowing their accounts receivable processing to a crawl, as nearly every document had to be entered manually. By applying Digital Check’s proprietary Special Document Handling technlogy, Lynnewood and its property management software provider, RentPayment, were able to clean up the money order images enough to make them readable, saving countless hours on payment processing. Digital Check is leading the way in image quality, with special techniques for image enhancement and cleanup designed to reduce the number of problem documents that banks and credit unions encounter in the clearing process. To find out more about our advanced imaging technologies, contact us or call your Digital Check account representative.